Lennon's 'lost' guitar to be auctioned Jump to media player A guitar owned and used by John Lennon, which was lost after a gig, is going to be auctioned in the United States. Beatles' Belfast gig photos released Jump to media player Five new photographs have been released from The Beatles' 1964 concert at the King's Hall, Belfast. 50 years since Beatlemania hit city Jump to media player It was 50 years ago today that The Beatles came to Cardiff at the height of their powers and played to 5,000 fans. Missing Lennon letter prompts movie Jump to media player The film about a letter to a folk singer from John Lennon which never arrived. 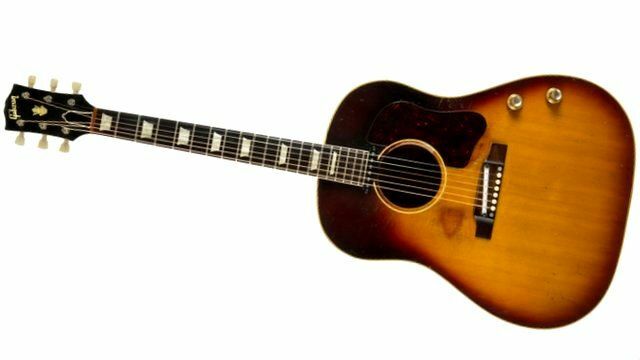 All you need is... a $1m guitar Jump to media player A rare guitar John Lennon played while he was in the Beatles is expected to fetch up to $1 million (£638,712) at auction. Old machines used to copy classic LPs Jump to media player Recording equipment that would have been used at the world famous Abbey Road studios by The Beatles is being used once again to create records on vinyl - at quite a price. Rare Beatles guitar to be sold Jump to media player An American auction house is selling an electric guitar played by John Lennon and George Harrison at the height of the Beatles' fame. The Gibson J-160-E acoustic guitar has been declared genuine by Beatles' instruments expert Andy Babiuk, who compared it to photographs and film footage of Lennon playing it.